Answers to Our 6th Anniversary Instagram Brain Teasers! 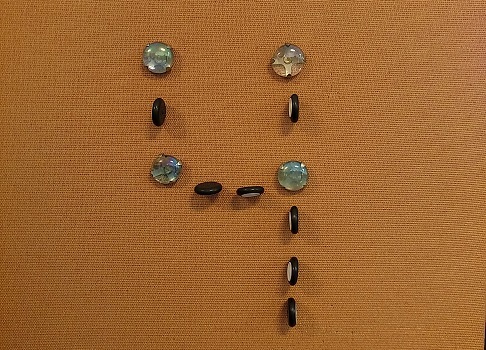 Last week, we celebrated six years of PuzzleNation Blog by announcing a week-long puzzly social media blitz. Facebook and Twitter saw twice-daily alerts for the puzzle of the day for both Daily POP Crosswords and Penny Dell Crosswords App, cuing solvers to contact us with the answers to particular across and down clues. Instagram solvers were encouraged to tackle a series of brain teasers, and today, we’ve got all the answers for you! Let’s jump right in. We started off on Tuesday with this relatively straightforward brain teaser: How can you add eight 4s together so that the total adds up to 500? We got the most responses to this one, and it’s no surprise, as we have some very crafty followers on Instagram. The trick here is number placement. By grouping 4s, you create larger numbers that make it easier to add to your total. 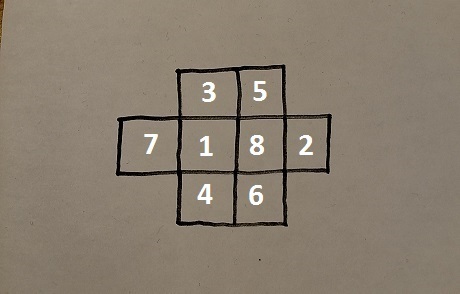 Wednesday’s puzzle involved placing the numbers 1 through 8 into the grid above. Consecutive numbers cannot appear in an adjacent or diagonal box. This puzzle was actually created and submitted by a PuzzleNationer named Sanjana, so kudos to you, Sanjana, as you made one heck of a brain teaser! 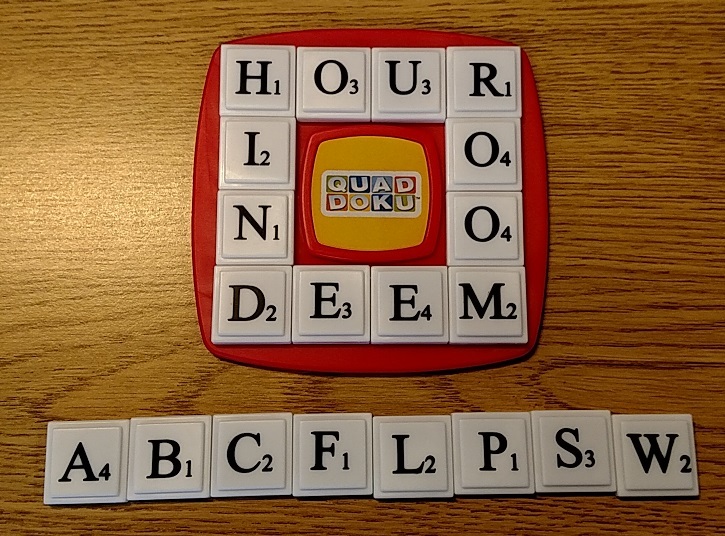 Thursday’s brain teaser put your Scrabble and Upwords skills to the test, as we played a round of Quad-Doku! The goal is to play each tile, one at a time, onto the board, forming a new common word (or words) each time. Do this with all 8 tiles in any order. By the end, all four corners will have changed. 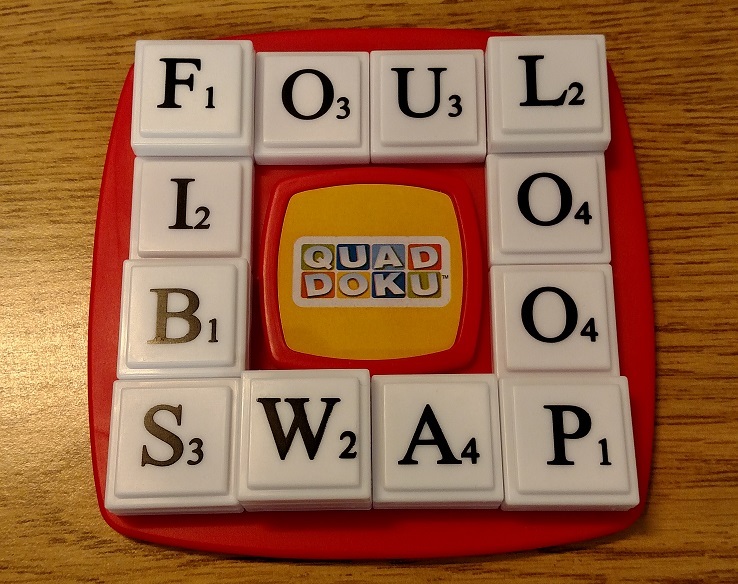 F makes FOUR/FIND, S makes FINS/SEEM, A makes SEAM, B makes FIBS, C makes SCAM, W makes SWAM, L makes FOUL/LOOM, and P makes LOOP/SWAP. 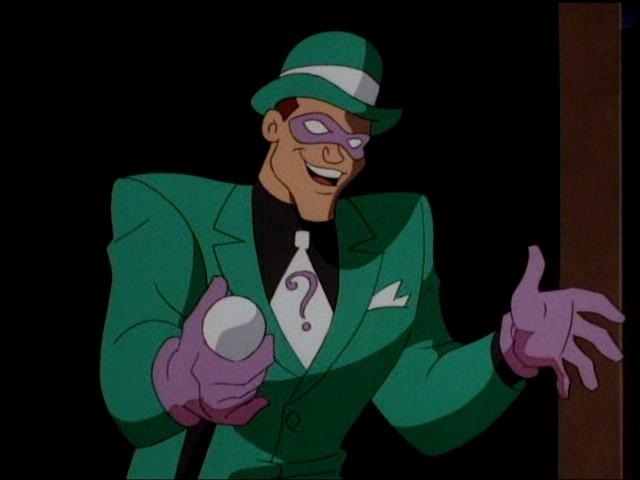 On Friday, we posted a riddle to test your puzzly skills. Once I am 24, twice I am 20, three times I am unclean. What am I? Solution: The answer is X. It’s the 24th letter of the alphabet, two X’s makes 20 in Roman numerals, and three X’s marks something as inappropriate for some viewers. 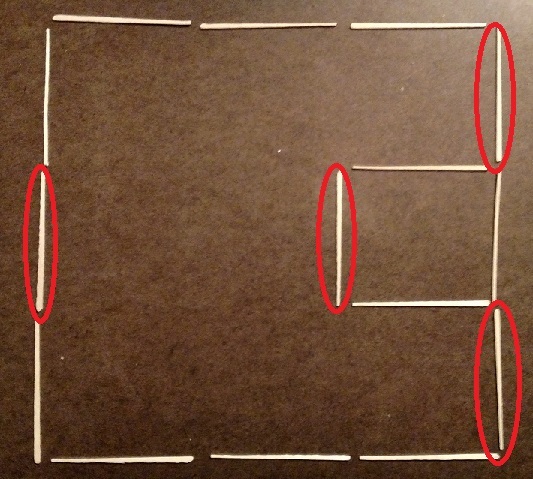 Monday brought us our final brain teaser, a matchstick puzzle (or, in this case, a toothpick puzzle). 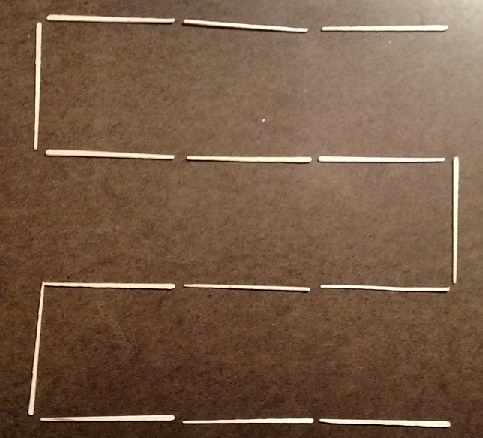 Can you move four toothpicks in order to change the zigzag path into 2 squares? 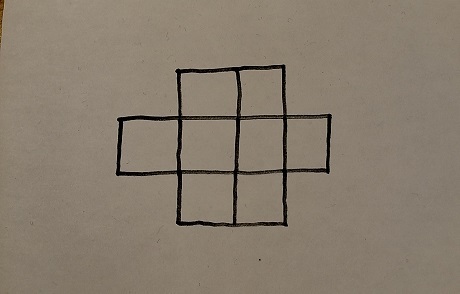 The two squares do not have to be equal in size. In the image above, we’ve circled the four toothpicks to move. And here is the completed puzzle, with two squares of unequal size. How did you do, intrepid solvers? Well, based on the responses we received, pretty darn well! We’ll be reaching out to contest winners later this week! But in the meantime, we’d like to thank everyone who participated in our PN Blog 6th Anniversary event. You help make this the best puzzle community on the planet, and we are forever grateful.